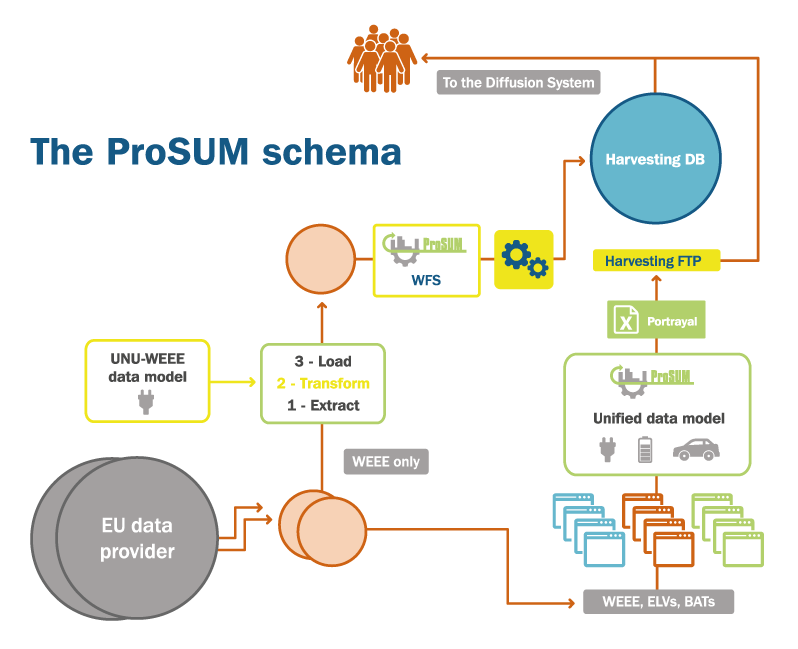 The ProSUM project will deliver the First Urban Mine Knowledge Data Platform, a centralised database of all available data and information on arisings, stocks, flows and treatment of waste electrical and electronic equipment (WEEE), end-of-life vehicles (ELVs), batteries and mining wastes. The availability of primary and secondary raw materials data, easily accessible in one platform, will provide the foundation for improving Europe’s position on raw material supply, with the ability to accommodate more wastes and resources in future. ProSUM will provide data for improving the management of these wastes and enhancing the resource efficiency of collection, treatment and recycling. ProSUM, Latin for ‘I am useful’, will create an Information Network that allows partners in the network to provide and use data by the creation of an inventory of waste streams with a high potential to serve as a source of CRMs. This ground breaking project will produce the EU Urban Mine Knowledge Data Platform (EU-UMKDP) providing user friendly, seamless access to data and intelligence on mineral resources from extraction to end of life products with the ability to reference all spatial and non-spatial data. The link to primary mineral resources is provided through the existing EU Minerals Knowledge Data Platform. The project will be addressed to a wide range of end-users, including the recycling industry, producers and producer compliance schemes, and policy makers. The project started in January 2015 and lasts for three years until December 2017. The project is funded by the European Union (€3.051m) and the Swiss Government (€0.63m). The information and content of this website is the sole responsibility of the ProSUM Consortium members and does not necessarily represent the views expressed by the European Commission or its services. While the information contained in the documents and webpages is believed to be accurate, the authors or members of the ProSUM consortium make no warranty of any kind with regard to this material. Neither the ProSUM Consortium nor any of its members, their officers, employees or agents shall be responsible or liable for negligence or in respect of any inaccuracy or omission, or for any direct or indirect or consequential loss or damage caused by or arising from any information herein. The designations employed and the presentation of the material in this website do not imply the expression of any opinion whatsoever on the part of the ProSUM Consortium concerning the legal status of any country, territory, city or area or of its authorities, or concerning delimitation of its frontiers or boundaries. Neither does the citing of trade names, companies, schemes or commercial processes constitute endorsement by any member of the ProSUM Consortium.